Choosing the colors and fabrics for your quilt can be a mammoth task. These days there are so many to pick from, each with different values, tones and quality. It is a good idea to first assess where you are planning on displaying the quilt and the effect it will have on its surrounds. For example if you are planning on using your quilt in your bedroom where it will be seen all day everyday, you should try and tie in the surrounding color scheme to give the room a feeling of harmony and balance . Please always take the time to step back when designing the layout and playing with the color scheme as it could make a huge difference to the overall effect. 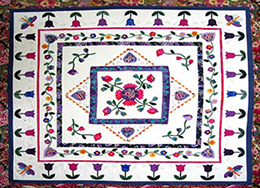 If you are ever in doubt ask someone what they think, particularly if it is someone you will be sharing the quilt with or giving the quilt to, they might be able to spot a color problem or even provide a solution.